Where Are the Baltic States? Estonia, Latvia and Lithuania are the three countries in northern Europe on the eastern coast of the Baltic Sea that are grouped as the Baltic States. The three Baltic states of Estonia, Latvia, and Lithuania featuring in the map of Europe..
What Are The Baltic States? The Baltic states are located along the eastern coast of the Baltic Sea in northern Europe. 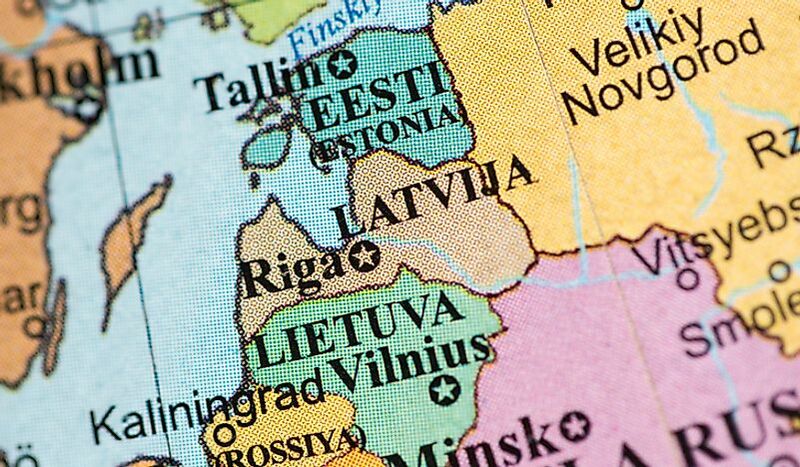 The countries making up the Baltic are include Lithuania, Estonia, and Latvia. These nations work together via several intergovernmental organizations and are also members of the European Union, North Atlantic Treaty Organization (NATO), and the Eurozone. Despite sharing geographic proximity, each country displays unique characteristics. For example, the native individuals of Lithuania and Latvia are Baltic people, whereas the native peoples of Estonia are known as Finnic and Finns people. This ethnic heritage has also influenced the languages spoken in each country. Additionally, Lithuania, Estonia, and Latvia have different political histories. Lithuania was previously a Commonwealth of Poland, while Estonia and Latvia were part of the Baltic German territory. By the 1700’s, however, these 3 countries came under the control of the Russian Empire. They won independence after World War I only to come back under Soviet occupation during World War II. During the 1990’s, these countries once again became independent. As previously mentioned, the Baltic states share many cultural, historical, and ethnic similarities while still retaining their individual uniqueness. In terms of religious practices, the greatest section of the population in the Baltic states observe Christianity. Individuals in northern regions most commonly identify as Lutherans, while those in southern regions identify as Catholics. Within Russian and East Slavic minority groups, Orthodox Christianity is cited as the most commonly practiced. Before Russia and then the Soviet Union controlled the Baltic states, this region was heavily influenced by several other countries, including Sweden, Poland, and Germany. The Baltic Finns ethnic group are the common ancestors of many people in Estonia and of the Livonian people in Latvia. The Balts and Indo-European peoples are the common ancestors of the many people in Latvia and Lithuania. The Russian and Soviet-ruled periods have also influenced the population here. In Latvia, 34.5% of the population is Slavic; this is further divided into 26.7% Russian, 3.3% Belarusian, 2.2% Ukrainian, and 2.2% Polish. In Estonia, people of Slavic origin make up 28.8% of the population; this mainly consists of people of Russian descent. In Lithuania, 13.8% of the population is Slavic. The four principal languages of the Baltic states are Lithuanian, Latvian, Livonian, and Estonian. The Lithuanian and Latvian languages belong to the Baltic language group of the Indo-European language family. The Estonian and Livonian languages belong to the Balto-Finnic language group of the Uralic language family, making them similar to the Finnish language. Because of this close relationship, Finnish is also a common language in Estonia. Estonia was under Swedish rule during the 17th century, which led to the Estonian language borrowing many words from the Swedish language. Estonian Swedish, a dialect of the Swedish language, continues to be spoken today in the northern areas of the country. During the German period of rule, between the 1400’s and World War I, the German language had a significant impact on academic works, the upper social class, and in professional settings. The same can be said of the Polish language in Lithuania. Additionally, Russian became an important commerce language in the Baltic states due to its previous control over the area and continues to be spoken by some populations today. Although the Baltic states have different political pasts, they do share some similarities today. These countries are all considered parliamentary democracies. The citizens of these countries elect a political representative to serve in a unicameral parliament for 4-year terms. There is a slight difference, however, in the political administration. For example, in Lithuania, the President is elected by popular vote. In Latvia and Estonia, the President is chosen by members of Parliament. During the Soviet-ruled period, the leaders of these countries considered the occupation to be an illegal imposition. This same opinion was shared by many developed countries, including the United States and the United Kingdom. These countries and many others chose not to recognize Latvia, Estonia, and Lithuania as part of the Soviet Union. Latvia, Estonia, and Lithuania enjoy a friendly political relationship. This cooperation developed during the Soviet occupation, fostered by the Forest Affairs Ministers of each country. Between 1989 and 1992, these ministers developed a close friendship as they sought the independence of their countries. In 1991, the Baltic Assembly was created, which consisted of parliamentary members from each country. By 1992, the Council of the Baltic Sea States was created. This was followed by the EuroFaculty in 1993. This regional cooperation was further strengthened with the development of a free trade agreement, BAFTA, in 1994. The agreement worked to open up access to trade with other European countries, which ultimately prepared the Baltic countries to join the European Union in 2004. The Baltic states are the only former Soviet-controlled countries to join NATO and the EU. Since becoming a member of the European Union, the Baltic states have continued to maintain close ties. The presidents of the three countries often coordinate on policy issues. This cooperation also extends to the Speakers of Parliament, Foreign Ministers, and Heads of Government. Despite this categorization, the economies of the Baltic states have suffered more than the previously mentioned reduction in GDP. The recession in these countries resulted in a significantly increased percentage of unemployment. For example, in Lithuania, the unemployment rate reached 13.7% in 2009. In the same year, it was 13.8% in Estonia and 17.3% in Latvia; these were some of the highest unemployment rates throughout Europe. Estonia managed to increase its growth rate by around 1.8% over the following years, keeping its debt levels lower than the European average. Latvia and Lithuania, however, were unable to achieve the same. Lithuania grew at only 1.3%, and Latvia experienced further recession by 1%. To avoid defaulting on loans, Latvia took out a €7.5 billion International Monetary Fund (IMF) loan. This page was last updated on July 27, 2018. Where Is the Baltic Sea?